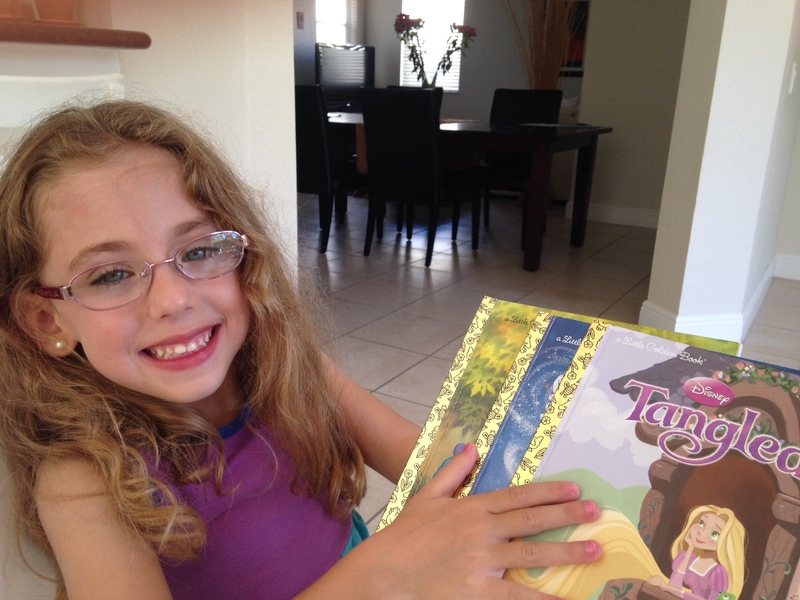 After watching the movie Tangled several times, Zoe told me that she’d love to have the book. I found it for $2.99 on Amazon and bought it that evening. I told her that the book would arrive in a box in a couple of days. Soon after, it arrived. – Mommy, my Tangled book!!! Can I keep it forever? – Yes of course! When we borrow books from the library we return them but when we buy them, we can keep them. – Yes!!! But Mommy, next time can we buy it in Books and Books (a Miami independent bookstore we love to visit). – Because it’s more fun to go to the bookstore than to get a box. Can we read it now? Pleeeeeasseeee? – But mommy… in the movie the bad guys say “The old lady told me to do it…” and the book says she’s young… that’s silly. Is she old or young? – No…! She also saw her parents, when she was a baby. Look. (She flips back to the image of baby Rapunzel with her parents). See? Her eyes are open. She saw them. – Well, perhaps what they mean is that she didn’t remember seeing other people because you don’t really remember things you see as a baby. This entry was posted in Dialogues with Zoe and tagged Tangled; Children; Kids and Books. Bookmark the permalink. She is one cool little person…..smart as a whip!